When you’re dealing with speakers this big and heavy, a simple courier drop-off isn’t quite possible! Anyway, today the Daleks have landed – not in air force blue, but gloss black – and it was never going to be a simple drop-off. After the courier arrived to take the 805 D3s back, a large truck arrived, and ‘Got a pallet for you’. 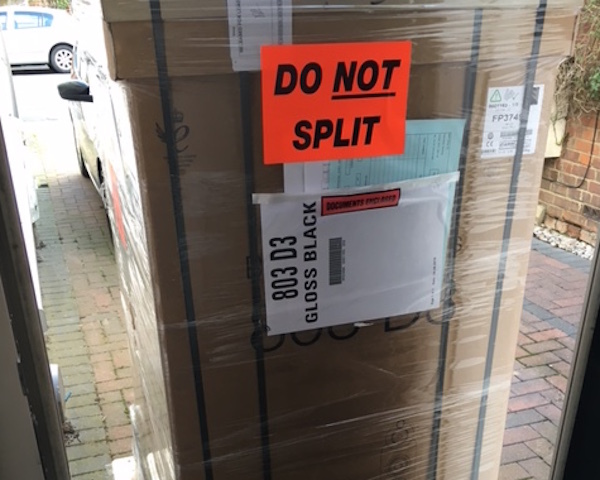 I’d been expecting it, having seen the 803 D3s being packed at the factory the other week, but the reality proved even more daunting: a double-layer pallet, with a pair of tall boxes strapped in place, each containing 65.5kg of speaker wrapped in almost 20kg of packaging. With some effort, I released them from the pallet, fortunately parked right by the front door, and – with bits pinging off the strapping left right and centre – dragged the two massive boxes one by one into the house. And there they sit, waiting for me to summon the energy to unbox them and start listening. 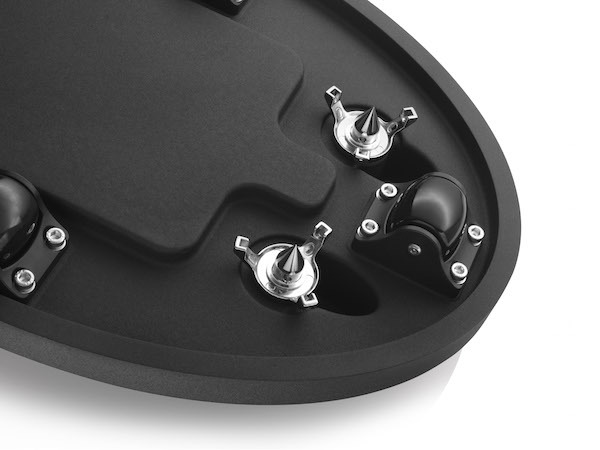 Fortunately that’s (hopefully) going to be the easy bit, thanks to the castors built into the plinths and that clever box: it disassembles to leave the speakers sitting on a platform with a slot-in ramp, down which the speakers trundle onto the floor before being positioned. I’m already excited to see and hear them in place, which is going to be a job for the weekend – I have a month to review them, and I’m looking forward to it. Monsters wonder if they sound better than they look!would not have them in my house,. Thanks ! Congratulations ! Anyway, today the Daleks have landed… and Dr. WH, what say … ?! What an exciting prospect! I recall items a third of that weight requiring great care to move around. Don’t rupture anything! Here we are in November, I am quite interested in your comments on the 805 D3. I appreciate your message I made a typo. 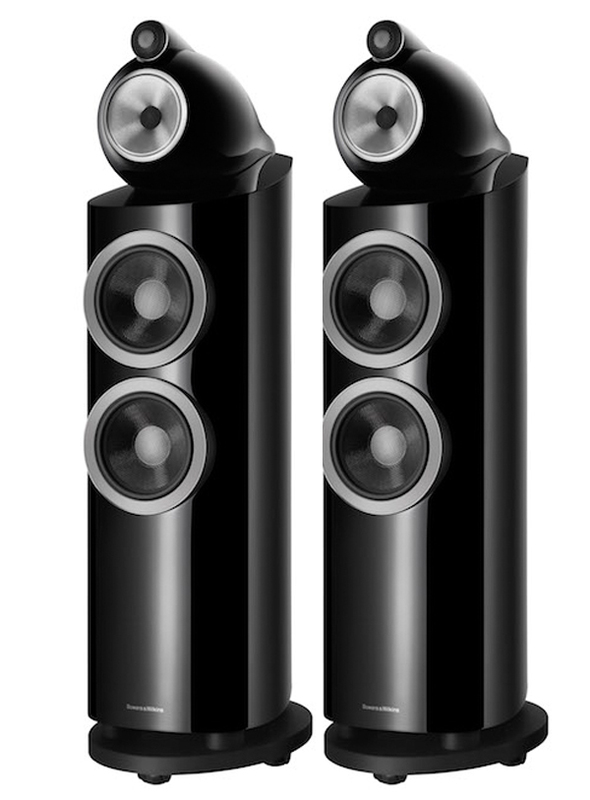 The 803 D3 is of interest as the design change and price point make it a possible heir to the previous 802 models for a reference audiophile system. I lack enough critical listening experience to confidently say the advances in materials, structure and dynamic response in the D3 design result in a listening experience closer to live music than D2. I would love to have the opportunity to listen to them for a month at home! Just like Jim, I am also very much looking forward to reading your full review of the B&W’s 803 D3’s. Do you by any chance know when it’ll be up?